Leslie Carto is a mom. Before that, she was pretty darn smart. She even won an Emmy for her work as a television news reporter. Leslie served on the board of directors for the Kansas City chapter of Variety Children’s Charity for nearly two years. Along with her (patient) husband, Rusty, Leslie is in charge of raising four-and-a-half year old, Will, and two-and-a-half year old Francie. Besides writing, Leslie spends her time pondering important issues: like what 1980’s pop hit would be blaring from convention hall speakers if she accepted her party’s nomination to run for President of the United States…or what her wish might be if a genie ever popped out of a bottle. Leslie hopes that each post she writes will someday serve as love letters to her children. 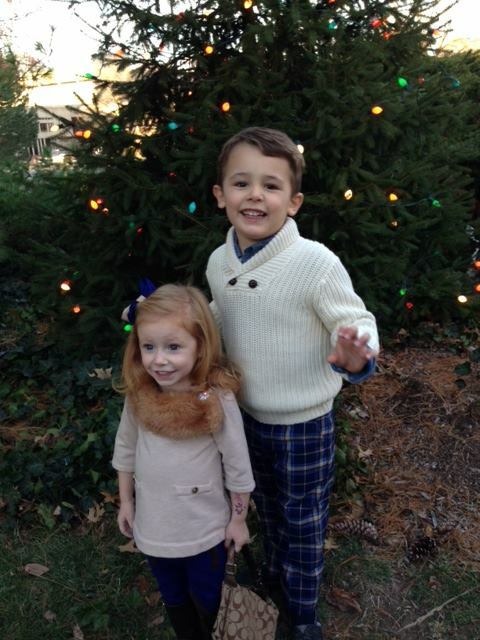 I wanted to send you a formal letter regarding the iPad that Variety gave my daughter, Gianna. It has made such a difference in her life. As you know, she just went through a very difficult surgery called jaw distraction. Jaw distraction entails breaking the jaw on both sides and placing a plate on each side. There are rods that are placed vertically and protrude from her skin at the top of her jaw. She was at Stanford’s Children’s Hospital PICU for 7 days and an extra 7 days in a hotel until the rods were cracked off (it was as bad as it sounds). During that time we had to place a tool on the protruding rod and twist it 3 times twice daily in order to distract her jaw and make it larger. Her surgeon was able to distract her jaw 20 mm! This enabled her to breath better due to the fact that she had severe sleep apnea and very small airways. She is also able to eat, smell and breath through her nose due to both surgeon’s expertise. Both her father and I are so glad that we chose the surgeons from California, but it was extremely stressful from a financial and emotional standpoint for our family. It is so incredible that you and your organization were able to help through this tumultuous time. Gia absolutely loves her new iPad. She just received a new hearing aid which has a streamer that she’s wears around her neck. 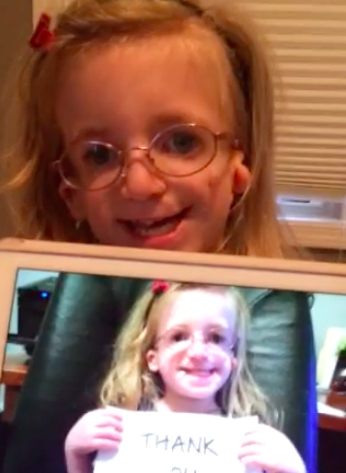 She is able to hear her iPad streamed directly to her hearing aid! It’s incredible. I truly believe that I have seen a difference in the clarity of her speech since receiving her iPad. It was so generous of yourself and your organization to give this wonderful gift to my daughter. Thank you with all of my heart. My daughter has cerebral palsy. She has two younger siblings, and we are a very active and busy family. Twice now my daughter has been the recipient of mobility equipment; a standing frame and an adapted racing chair (for running and biking). She is able to participate in triathlons, road races, bike rides, walks, runs, and more right along with us as a family. Variety is awesome! 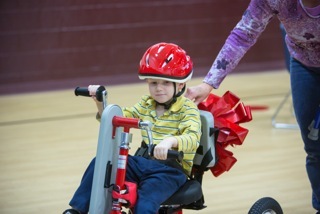 My son has special needs and Variety has helped me get him the tricycle that he wanted. Now he can play with the neighbor kids!! I have been involved with Variety a little over 2 years. They are great!!! What a great organization to be involved with!!! They far-exceed my expectations!!!!!!!!!!!!! I have a special needs daughter (muscular dystrophy, epilepsy, brain tumors, osteoporosis and spina bifida occulta). When I was in need of a lift for her motor scooter because I can’t lift it and our van is not big enough, I looked online and found Variety! Our lives have been changed forever. Sometimes having special needs children you feel helpless, but after meeting Deb I have a whole new energy. Not only did they jump right on getting us the lift we needed for the van, Deb has shown us a love that no other has shown. Variety has provided us with many opportunities to be “normal” and go do “normal” things. Anytime I see a child or family struggling with a special needs child, I tell them all about Variety. There is no way I could ever repay Variety for the freedom they have given, except to share my story. We are very grateful to Variety KC for the Walk-Aid they helped payed for. The Walk-Aid has made a huge difference in Kaleb’s life since he has received it, he has been able to purchase normal shoes, and is looking forward to starting basketball again this January. Thanks to everyone that has donated to this foundation and made a difference in our son’s life and others like him. This is a great organization who cares about the quality of life for children, and I appreciate them so much.